Please check out my Recipes link just above this post. I've been working hard on compiling a one stop shop of recipes from my blog and finally finished it! Our Baked Sunday Mornings recipe today was one of the recipes that I couldn't wait to make. 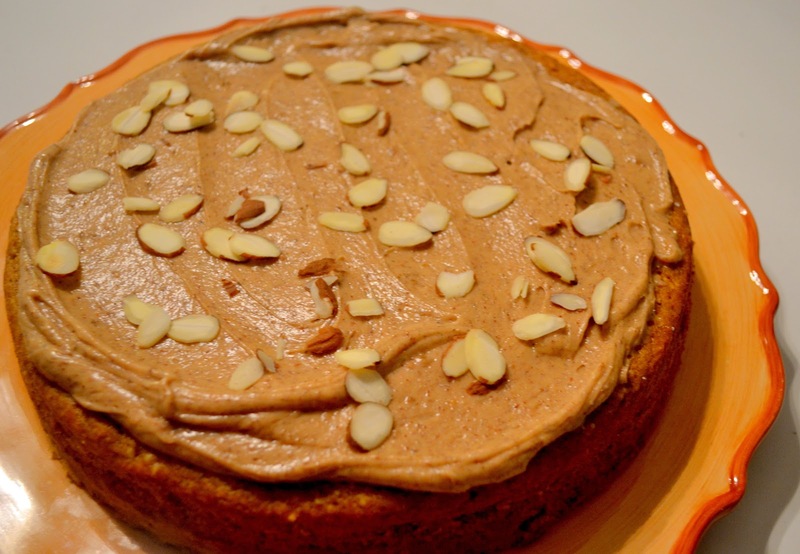 Pumpkin and almonds are two of my absolute favorite ingredients to work with so how could I not want to make Pumpkin Almond Cake with Almond Butter Frosting? But what really got me was that it features just one layer making it an easy, weeknight, cake and almond butter in the frosting. While I enjoy challenging myself and making desserts that are lovely to look at, I often prefer rustic desserts. Things like chunky chocolate chip cookies and galettes and cakes that you cut with reckless abandon and eat with your hands warm from the oven. This recipe certainly falls into that category. I love the texture that the almond flour adds to the cake and using almond butter in the frosting is genius. This recipe, while just about perfect as is, could easily be adapted. Don't like almond flour? Substitute with additional all-purpose flour for a smoother texture. Add other nuts for crunch or some banana. If you prefer something even simpler, omit the frosting or add a quick glaze. The options are endless. To get this gem of a recipe, please visit Baked Sunday Mornings! Your cake looks fabulous! It was an easy cake to make and I like that ease as well. Sometimes the most simple recipes are the most enjoyable. I loved this cake, but not the frosting. I would make the cake again, just with either no frosting or maybe a cream cheese frosting. Candy - your cake looks just like the picture in the book! Congrats on your recipe index - that must have been a ton of work. I love that this cake was simple & festive. I love rustic desserts, too! I feel like it should hurt our feelings to cut into something and devour it. Looks great! Agreed! I love a hearty dessert that it doesn't pain me to cut! Your cake looks just perfect! There is something so comforting about a rustic dessert, isn't there? Beautiful work! Your cake looks beautiful. I loved everything about this cake and probably won't make any changes, but you are right - it could easily be adapted. Rustic desserts are the best! By the time I'm done with fancy layer cakes, I usually have made a huge mess and gotten annoyed because they don't look perfect. This was a great cake. And congrats on the index! I love the sound of this cake - the combo of the pumpkin and almonds is a winner! It's beautiful too! I LOVE almond butter. I actually eat it more than peanut butter. So nice to hear from you. Sounds like you enjoyed this cake as much as we did...just finished the last slice at dinner tonight. Your cake looks great and I know it tasted great...I ate more than my share. Enjoyed your post. "Cakes that you cut with reckless abandon and eat with your hands warm from the oven" <---I do this all the time and don't apologize for it one bit! ;) Your cake looks perfect! I love the glaze idea...I also think the cake would be great sans frosting with a big plop of freshly whipped cream. This looks so pretty with the almonds scattered across the top. I agree that the cake is easy and good and adapting it is a great idea. I'm so with you on the love for rustic desserts. I have a total obsession with Bundt cakes.. I think just for that reason. Yours is beautiful. And congratulations on finishing what looks like a big project - your recipes page looks great! This is such a great combination of flavors :). I really like your blog and I've nominated you for the Liebster Blog Award. The information about it is available in todays post. Hope you're having a great day!